•Select Time Schedule from the Data Type drop down list. •The next step allows you to preview the source data before importing, and choose a subset of the source data, e.g., a worksheet of an excel file. Select which Excel worksheet to import from the Select Worksheet drop down list. Also, you can choose which row to import from using the From Row text field. •The next step involves selecting the type of time data used in the source file. •If the time values are expressed in relative time select the Relative option, and specify the starting date and time from the combo boxes. If the time values are expressed in absolute time, select the Absolute option. •Click the [Next] button to continue. •The next step involves data mapping and creating attributes. The required target fields will vary depending on which option was selected in the previous step, e.g., Absolute or Relative. •If you selected Absolute, the required target field will be Start Date and Time, and if you selected Relative, the required target field will be Relative Time. Map the time field in your source data to the required target field. 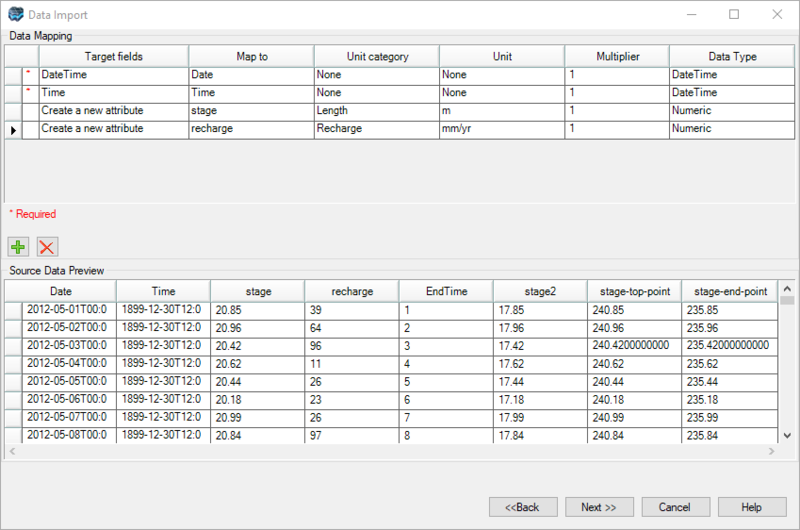 •Next, create a new attribute, and map any associated parameter, e.g., recharge, in the source data to the new attribute. If necessary, repeat for additional parameters in the time schedule. Data mapping and creating new attributes are described in the "Data Mapping" section. The final step in the time schedule import process is data validation. Visual MODFLOW Flex will validate the mapped data, and highlights any rows that contain invalid data, e.g., null values, wrong assigned data type, duplicate rows etc. Please see "Data Validation" for more information on data validation. Click the [Next] button to import the data. 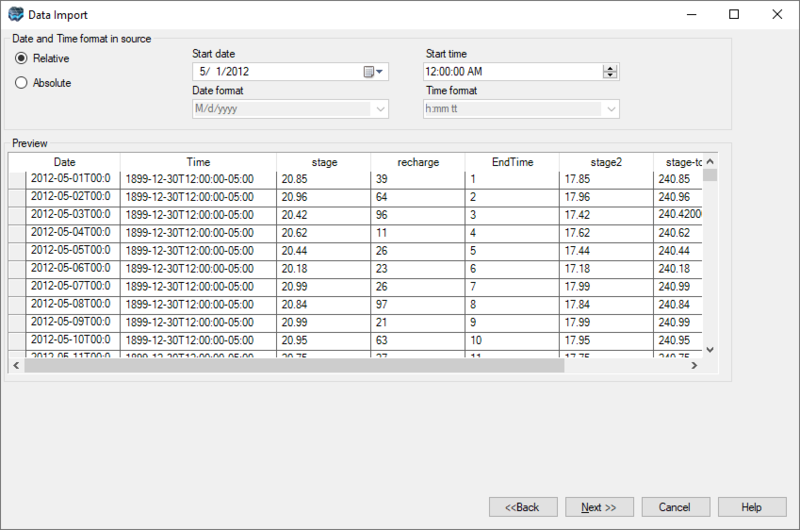 Once imported, a time schedule data object will be added in the Data Explorer.